Although tix are sold out, donations to fund the event are accepted here. 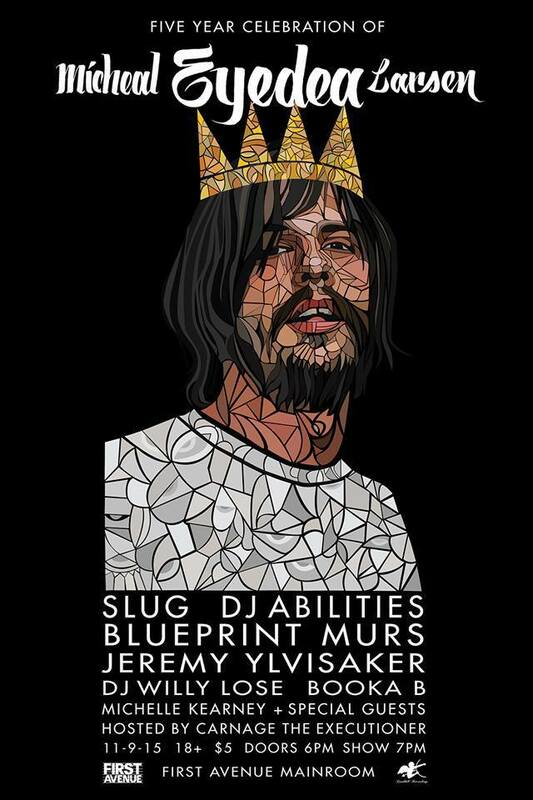 The FIVE YEAR CELEBRATION OF MICHEAL EYEDEA LARSEN​ presented by Crushkill Recordings​ is Monday, November 9 2015 at First Avenue & 7th St Entry​. Featured performers include SLUG of Atmosphere​, DJ Abilities​, Blueprint​, Murs​, Jeremy Ylvisaker​, DJ WILLY LOOSE, Booka B​, Michelle Kearney​, Seez Mics​, and special guests. Hosted by Carnage The Executioner​.